This is a tale about an incredible trio: Oppy, the indomitable motorcycle, its 125-pound frame swaying under three times its weight; Matelot, the automotive Airedale, perched on his box, ears flying in the breeze; and the gasoline gypsy, Peggy Iris Thomas, who bumped her way over 14,000 miles of the United States, Mexico and Canada. There is a touch of the vagabond in all of us. But few have the determination and courage that started Peggy off from Liverpool in the spring of 1951 with 60 dollars in her pocket and the gleam of adventure in her eye. Her new BSA Bantam motorcycle, Oppy, was loaded to straining point with clothes, food, and complete camping equipment. Matelot, both companion and guardian, stood wagging his tail by her side. Before they turned homeward once more Peggy and Matelot were to pitch their tent in such places as a vacant lot in downtown Los Angeles, a Mexican village bar room, a mosquito-infected Louisiana swamp, and on the heights of New Jersey’s Palisades. 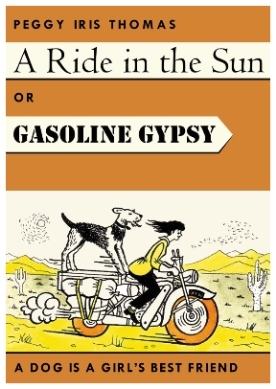 In A Ride In The Sun - Gasoline Gypsy, Peggy tells the lighthearted story of her adventures whilst motorcycling through the forests of Nova Scotia and over the Canadian Rockies, stopping long enough along the way to recoup her finances by holding down two office jobs at once in an eighteen-hour working day in New Brunswick, and working as an apple picker and factory labourer in British Columbia. Then off down the beautiful Pacific coast, south east to Mexico and up the eastern seaboard to New York City. Undaunted by sandstorms, earthquakes, tropical gales and incredible desert heat, thrilled by the invigorating life out doors and cheered along by her many new-found friends, she has woven her unique journey into an engaging account of life on the open road.